Jump straight into the middle of the action with your favourite LEGO ® NINJAGO ® characters in this fantastic LEGO book for children beginning to read. Join Kai, Zane, Cole, Lloyd, Jay and Nya as they as they harness their powers and face an epic adventure against an army of snakes! It's time for the Ninja to discover some exciting new heroes and enemies. 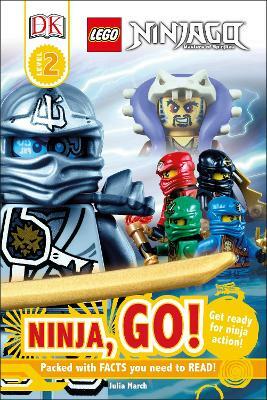 Combining DK's four-level reading scheme with popular LEGO NINJAGO sets, LEGO NINJAGO NINJA, GO! is at Level 2 and will help kids learn to read - and to love reading. LEGO, the LEGO logo, NINJAGO, the Brick and Knob configurations and the Minifigure are trademarks of the LEGO Group. ©2015 The LEGO Group. Produced by Dorling Kindersley under licence from the LEGO Group.